How to apply gel nail polish? We sell all over the North America and Europe. Top and base Gel polish. Selection of top coat and base coat for gel nail polishes that cure under a UV or LED lamp. Base coat protect your nail and top coat increase the gel nail life and makes it shiny. Gelish Structure Cover Pink Soak Off Gel Nail Strengthener Thick brush-on gel for stronger nails. Gelish Structure Translucent Pink Soak Off Gel Nail Strength Thick brush-on gel for stronger nails. Gelish Structure Gel Building Gel Brush on Formula 15mL Thick brush-on gel for stronger nails. Gelish Vitagel Recovery Gel Polish Strengthener 15mL Base coat and treatment for stronger nails. Gelish Vitagel Strength Gel Polish Strengthener 15mL. Base coat and treatment for stronger nails. Get a matte finish over regular polish, gel polish (such as Shellac or Gelish) and on UV Gel with this no wipe UV/LED top coat! 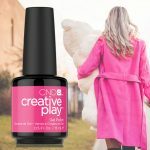 Creative Play Gel Polish - Top Coat Creative Play UV Polish is a new generation of gel polish. Creative Play Gel Polish - Base Coat Creative Play UV Polish is a new generation of gel polish. Base coat for UV gel polish from Gelish. Save 5% when you buy the Top and Base Coat combo! Shellac is a UV Gel nail polish that last over 14 days. Opaque color. The brush is flat for an easier application. Nail surface cleanser that improves adhesion of nail enhancements. Shellac UV Polish Top Coat Duraforce 15 MLCND’s toughest, most durable Shellac Top Coat designed to give extra protection to weak nails against breakage and daily wear. Shellac UV Polish Top Coat Duraforce 7.3 MLCND’s toughest, most durable Shellac Top Coat designed to give extra protection to weak nails against breakage and daily wear. Bottle of 250 mL of 99.9% alcohol. Self-adhesive nail wraps ideal for the removal of soak-off UV polishes such as Shellac! 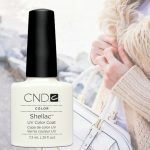 SHELLAC XPRESS5™ 15 ml from CND™. This amazing top coat can be cure with LED and UV lamps. That is not all, it dissolves in 5 minutes only. 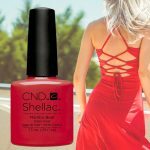 SHELLAC XPRESS5™ 7.3ml from CND™. This amazing top coat can be cure with LED and UV lamps. That is not all, it dissolves in 5 minutes only. 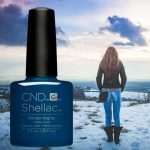 CND Shellac Vernis UV Top Coat 7.3 ML (SHE40401) Fournit la couche finale, durable, qui conclut l'ensemble avec une finition façon miroir. Shellac UV polish Base Coat 7.3 ML (SHE40400)Dry in 10 seconds and is the essential basis of the Shellac system. Held up to 14 days. Fini-Plus LED and UV No Wipe Top Coat 15ml. it's the most versatile top coat : can be applied on regular polish, gel polish, Gel nais. Very long-lasting!